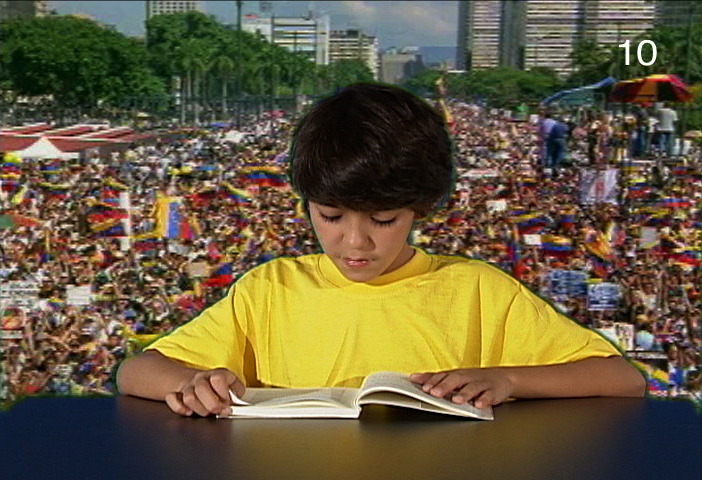 Note: The Spanish version of this work (originally recorded in English as Remarks on Color and in German as Bemerkungen über die farben in 1994) was recorded in Venezuela and created especially for the exhibition “Gary Hill” at the Fundacion Centro Cultural Chacao, Caracas in 2008. Remarks on Color is a single-channel video/sound installation which uses projection literally and metaphorically to set up an ambiguous space of readership and reception where meaning, sometimes mutated, broken or perhaps reopened, is ultimately transmitted in the spirit of play. Through a child’s spontaneous reading of philosophical questions on the nature of color, a different “coloration” to Wittgenstein’s idea of language games unfolds. Remarks on Color, Part 1, consisting of 88 segments, is read in real time over a period of approximately 45 minutes, and Hill asked the child to negotiate every word the best he could. 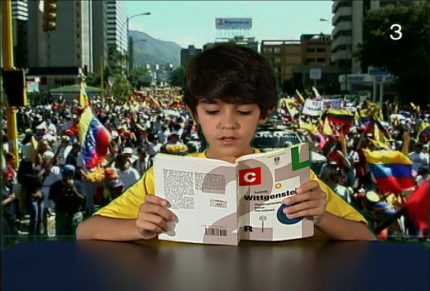 This version of Remarks on Color is unique in that the background consists of very slowed-down (almost abstracted) images of political protests in Caracas – ‘colorful’ in their own way – which juxtapose the child’s reading of a very philosophical, abstract work with the concrete realities of the current political climate. Additionally, it is considerably longer at 76 minutes. 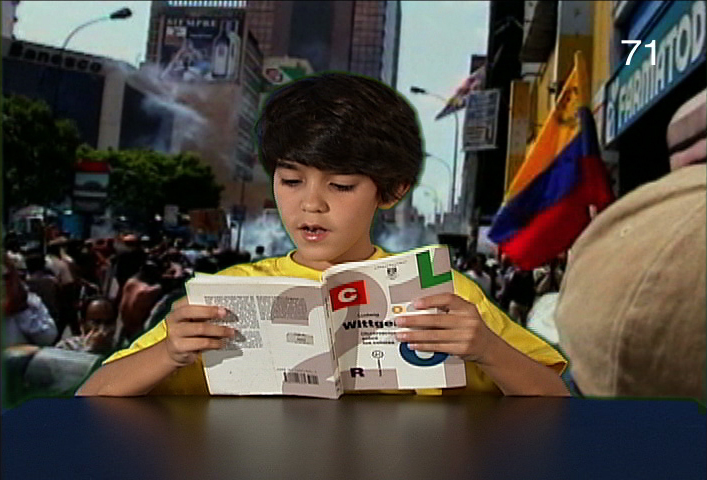 Fundacion Centro Cultural Chacao, Caracas, Venezuela, November 5, 2008 – January 20, 2009. Quasha, George and Charles Stein. An Art of Limina: Gary Hill’s Works and Writings. Barcelona: Ediciones Polígrafa, 2009, pp. 275, 284, 311, 329, 331, 337 – 339, 445, 589, 605, 606, 612. Ramos, María Elena. Gary Hill. Caracas: Centro Cultural Chacao, 2009 (in Spanish), pp. 11 – 12, 14 – 17.